Komagane (駒ヶ根) is a quiet city of 30,000 inhabitants in Nagano (prefecture). 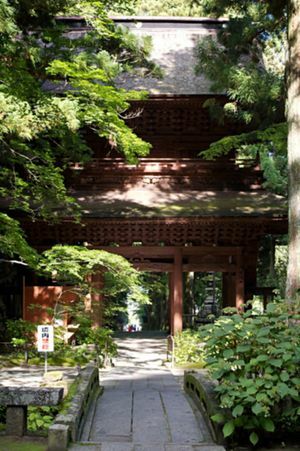 Komagane draws people mostly because of its superb location close to the Chuo Alps. Also the mountain resort of Komagane Kogen just few kilometers west from the central is an attraction. The tourist information is across the JR station, a bit right from the supermarket. In Komagane Kogen, there's tourist information in the Komagane Farm's building. Komagane station is a stop on the JR Iida line. If coming from Tokyo, you need to change the train at least once and the last leg with the local train is slow. Fastest connection to Shinjuku takes 4:15 and costs ¥6410. Using only local trains will cut your costs to around ¥3000, but the travel time increases to more than 6 hours. Highway bus is by far the best option if you're coming from Tokyo. The trip from Shinjuku takes 3 and half hours and the bus connections are frequent, about once per hour. The buses depart from Keio Highway Bus terminal in Shinjuku, just opposite the main building of Yodobashi Camera. One-way ticket costs ¥3650. In Komagane the highway bus terminal is a couple of blocks west from the JR station. There are also bus connections to Nagoya (central ¥2980, airport ¥3800), Nagano (¥1730), Osaka (¥4880) and Matsumoto (¥1080). The most interesting bus line for the traveller is the bus leaving from Komagane JR station, going through Komagane Kogen and terminating at Shirabidaira ropeway station. The bus will depart every half hour between 7am and 5pm and is labeled clearly with a "Komagatake Ropeway Station" sign. Trip from the station to Shirabidaira will cost ¥1000 and to Komagane Kogen ¥410. Komagane is a good starting place for hikes in the Chuo Alps mountain range. 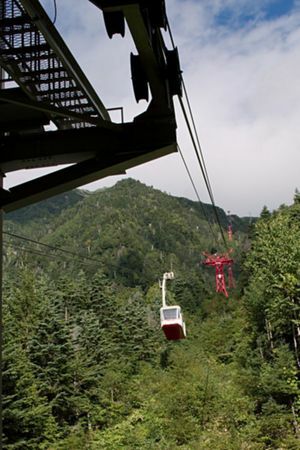 The ropeway can shorten your climb notably. Across the station there's a supermarket, aptly named Foods.com. Sauce Katsudon is a local speciality, and there is something of a competition among the local restaurants as to who makes the best. Consistently coming in at the top is inagaki, a restaurant a few blocks away from the local junior high school. They specialize in sauce katsudon, and green tea soba. There a couple of simple business hotels near the station, where you can get a bed for around ¥6000. In Komagane Kogen, there are plenty of choices, prices are typically around ¥8,000-10,000 per person. This page was last edited on 4 November 2011, at 11:19.